A resolution has passed in the UN General Assembly slamming Israel’s use of ‘excessive force’ against Palestinian protesters during their Great March of Return in Gaza, with more than 130 killed and thousands injured. Many of the protesters were unarmed but encountered live ammunition from Israeli snipers. Victims included journalists and first aid responders, who were well marked but were targeted and slaughtered anyway. Nikki Haley, the American UN envoy, was adamantly opposed to the resolution and submitted an amendment of her own in which Hamas was to be condemned as the aggressor, with no attention being paid to the death toll racked up by the Israelis who were not being attacked by civilian protesters, which failed to obtain the necessary support in the Assembly. The UN General Assembly has adopted a nonbinding resolution condemning Israel’s use of ‘excessive force’ against Palestinian protesters in Gaza. A US amendment to condemn Hamas did not get enough support. The resolution condemns Israel for “excessive use of force” against Palestinian demonstrators on the Israeli-Gaza border and calls for the “protection of the Palestinian civilian population” in Gaza. It was adopted with 120 votes in favor and eight votes against, with 45 abstentions. The amendment offered by US envoy Nikki Haley sought to condemn Hamas, which runs the elected government in Gaza, for firing rockets at Israel. The amendment received 62 votes in favor, with 58 nations opposed and 42 abstaining. It needed a two-thirds majority to pass, however, so it was not included in the final resolution. The nearly identical resolution proposed by Kuwait was vetoed by the US in the Security Council on Tuesday. Unlike the Security Council resolutions, those adopted in the General Assembly are non-binding. “I have a simple message for those who support this resolution. You are the ammunition for Hamas’s guns, you are the warheads for its missiles,” he said. Over 130 Palestinians have been killed by Israeli forces during the protests along the border with Gaza that began on March 30. The deadliest day so far has been May 14, when the US embassy officially moved from Tel Aviv to Jerusalem. “We cannot remain silent in the face of the most violent crimes and human rights violations being systematically perpetrated against our people,” said Riyad Mansour, Palestinian envoy to the UN. In another area in which the US supports violence against unarmed civilians, the US continues to back the Israelis in their aggressions against the Palestinian people. America has been increasingly making itself the odd man out in international affairs as of late, so why drop out of that role now? Even when the Israelis are publicly the ones doling out the greater degree of death and suffering, they are continually peddled by the US as the victims of a people who suffer blockades of nearly every human necessity and armed violence from the Israeli government, which perceives them nearly as subhumans. It’s funny see all those head banging joos on the wall of the ROMAN temple. It is quite clear that Israel’s agenda has met with widespread condemnation by the member states of the United Nations. 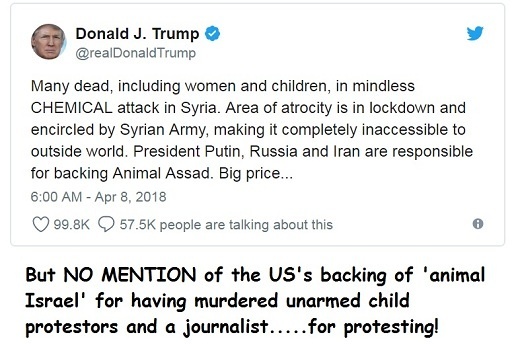 The US clumsily defending the killing of journalists, medics and unarmed people including women and kids? Sounds like standard operating procedure when we’re talking about Israel, but the US also reserves the right to use the same argument to justify invading and killing thousands in regime change ops. Interesting how that works. Any nation not embarrassed enough to keep Nikki Haley out of the UN is intellectually bankrupt, forget morally. It’s not a sin to defend your country so do not blame israelis s for defending themselves against wild Arabs attackers. They new what were they doing and that they put at risk they lives. Jerusalem is a Capitol of Israel ant help us with it God. Maybe if they stopped trying to invade Israel, Israel would stop killing them. If you break into my house, I will shoot you!!!! Your family might sue me, but YOU won’t.